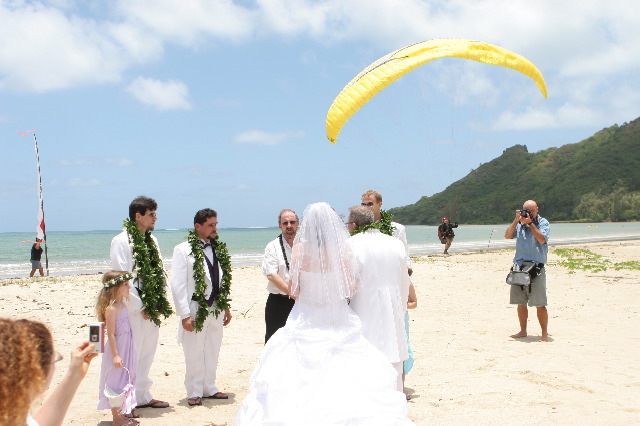 Hillery and Pete exchanged vows on the beach at Kahana, surrounded by family and friends, many of whom had landed there just moments before, following the tuxedoed groom down from the heavens. Young maidens sprinkled the sand with flower petals as the bride, her cheeks damp with tears of happiness, glided out from the shady tree line onto the beach, swathed in a gown that reflected the full glory of the midday sun. A more beautiful bride has never graced our humble shoreline. Cold refreshing springs bubbling right out of the sand! Dark springs and light springs! Two days in a row of great flying weather for an event scheduled long in advance! Pete landed on his feet in front of the entire assembly of wedding guests! Rich flew twice in one day and soared for the first time! Bob and Sandy showed us they can both still fly! Friends and family took to the air under scores of tandem wings. We filled our three campsites to the brim: 10 tents holding 30 happy campers for untold hours of nighttime revelry! And the final miracle: all my pre-wedding jitters about unwanted attention from the authorities proved to be unnecessary. I guess the highest authority was watching out for Hill and Pete on this special occasion. Dave was part of the pre-ceremony aerial regatta, and he trailed a long streamer from his harness to paint flowing figures in the sky while the first wave came in to land. He had also armed himself with a large sack full of flower blossoms to sprinkle down onto the bride as she appeared on the beach for the ceremony. But just as she appeared, and he was pulling into the perfect upwind position over the bay, he suffered some kind of sack malfunction: the distractable few who were able to take their eyes from Hillery's grand entrance saw Dave's entire bag of blossoms drop into the ocean directly below him. It wasn't a big deal, since few of the wedding guests knew what to expect anyway. A very minor flaw in an otherwise blissfully perfect plan. Reaper ended 19 years of perfect accident-free flying by whacking the back of the hill behind mid launch after he launched Jared's buddy on a tandem with a major compression knot. His passenger was unhurt, but Pete is now suffering from a very sore knee which the groom diagnosed as a possible ligament injury. Take it easy on that knee, Pete, and get it checked out if it's not better soon! 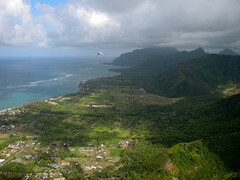 Visitor Chip from Colorado got lost in a cloud and found himself over the back in Punaluu. He landed somewhere near the shrimp ponds, and walked back to join the party. Chip flies the front range with our recent Kauai pioneer from Colorado, Andy, and also knows Big John from Breckenridge really well. He'll also be at Jackson Hole in time to meet up with Czech Pete for the fly-in there. 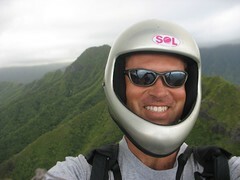 I took visitor Wes from San Diego downrange on his first Oahu XC, to land at Hauula Beach Park. We tried to coax other folks to join us but I guess the lure of the bubbling cold springs at the beach proved too hard for most folks to resist. Wes had missed the chance to follow us downrange the other day, and he was overcome with glee to have made the trip on this occasion. Thanks to Berndt (driving Reaper's truck) for the retrieve. I took a few pictures along the way. Finally, at the end of a very long and full day, we found Reaper dozing blissfully by the bonfire in a chair, with his boombox in his lap. As we tended to the cold bubbling springs one last time, we heard Dave sound the alarm: "Man Down!" Reaper's chair had toppled sideways, sending him crashing to the sand and waking him up. He asked Wayne and me to give him a hand, only to pull us down on top of him, repeatedly, until we figured out he was just having fun with us, as Dave fought back tears of laughter and rolled the camera for YouTube. I know you all have other great stories, as well as pictures and video from the weekend. Please share them with us! Feel free to write your own article to showcase them, or send me a link to them and I'll update this article to include them here. The headline photo is an early unretouched preview of one that Bob took and sent to me as a placeholder. Thank you to all for making our wedding day so wonderful. We couldn't have done it without you. I have one last thing to ask of all of you. Please check your cars, bags, tents, ect. for a Canon power shot digital elph camera. I have managed to misplace my carmera with many wonderful pictures. Your assistance would be greatly appreciated. Congratulations and many thanks for the awesome party! Somebody left a flip phone in my beach chair pocket. it is a LG / At&t. call me at 779-9013 or Noell at 782-3126 to pick it up.